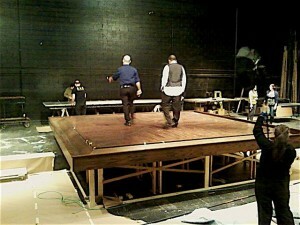 The Court Theatre’s Chicago premiere of Satchmo at the Waldorf continues to take shape. On Thursday Barry Shabaka Henley and I got our first look at John Culbert’s set, which is currently under construction on the stage of the Court. Then we went back to the rehearsal room and conferred at length with Keith Parham and Andre Pluess, the lighting and sound designers. Once that was done, Barry, Charles Newell, and I started rehearsing again. I can’t quite say the same: I’ve written two pieces, a Weekly Standard essay about Harold Arlen and a Wall Street Journal “Sightings” column about Cy Walter, since arriving in Chicago on Monday. Otherwise, though, I’m totally focused on Satchmo. It’s a kind of tunnel vision that I find exhilarating precisely because I don’t get to indulge in it very often. I usually have too many balls in the air to concentrate on any one thing for more than a couple of hours at a time. 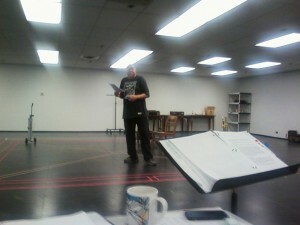 For me, then, these rehearsals are a kind of vacation from the distracting hum and buzz of my everyday life. When you’re working straight sixes in a rehearsal room, even the most complicated of lives is necessarily simplified by sheer force majeure. It won’t last, of course. On December 20 the spell lifts and I fly back to New York for opening night of Fiddler on the Roof, after which I return to Connecticut, Mrs. T, and Christmas, followed by our annual visit to Sanibel Island, which I never fail to find restorative. I’ll be grateful for those things in due course, but not yet. For now there is nothing but the show: no deadlines, no worries, no future, not even an opening night. This is a time to rejoice—and work. Like the man says, that’s all there is.